Developed exclusively for OnePageCRM, the Next Action sales methodology is inspired by David Allen’s GTD or Getting Things Done, productivity principles. In the same way that GTD increases productivity and improves time management; when the Next Action is applied to sales, it becomes a powerful tool which focuses you 100% on taking action. By encouraging upfront decision making and applying a Next Action to each of your leads and customers, you can ensure you never miss out on an opportunity to sell. 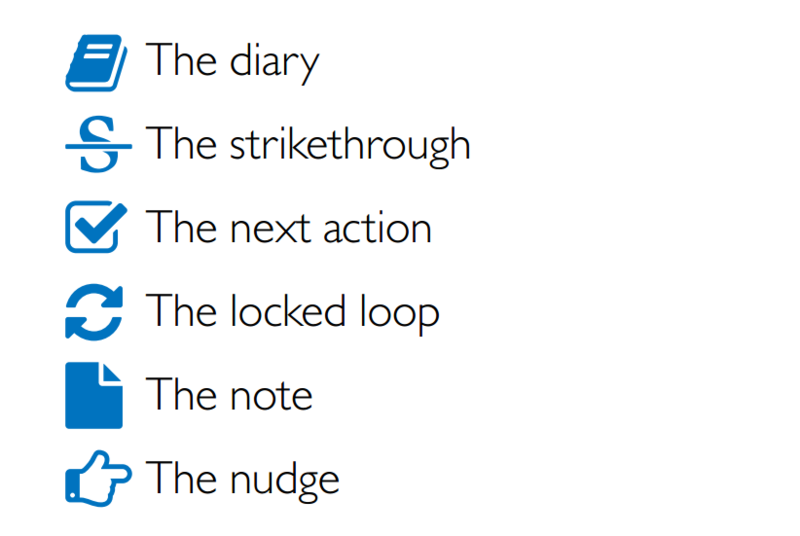 The Next Action sales method involves a number of elements, namely: the diary, the strikethrough, the next action, the locked-in loop, the note and finally, the nudge. 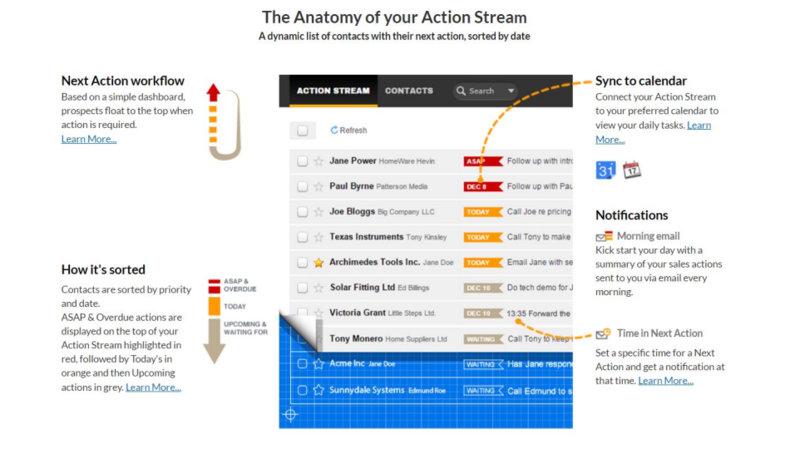 The beauty of the Next Action sales method, is in it’s simplicity. It does not require hours of training, you don’t have to read multiple productivity books to understand the concept. In fact, all you need to implement it is a pen and diary. It really is that simple. 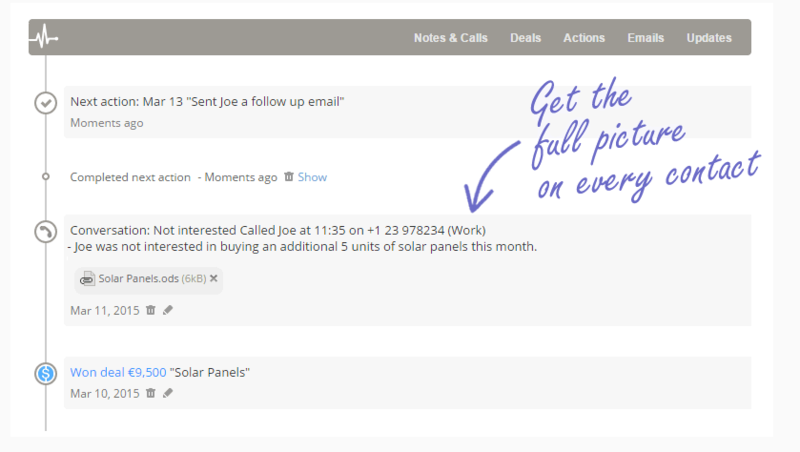 Record every interaction (however seemingly insignificant) you have with your prospects and customers, in the diary. Also, note the future follow-up action to be taken on the appropriate date in your diary. Come that day and time in your diary, you will come across the reminder, follow-up with said prospect and take action in accordance with your notes. Once you have the diary, the next element is the strikethrough. When you open your diary on any given day you will be confronted with a number of sales actions ready for your attention. You pick one. – Call Jo about project estimate. You complete the action and put a satisfying line through the item. -Call Jo about project estimate. It is important to keep a proactive approach to setting your Next Actions with a client, by deciding on the follow-up action directly after completing the last. This is the time when you have the clearest perspective of the situation and what’s required next. Being proactive at his stage, will improve the quality of future actions, making them easier and more automatic to execute when the time comes. Once you have decided on the next action required to move the sale forward, you can write this into your diary on the date of proposed action. Once noted, you can then forget about that action for the time being, freeing up your mind for other tasks. All your Next Actions are locked into a system, moving around in proactive cycles; disappearing from view when not relevant, reappearing when the time is right, thus creating a locked loop of sales actions. 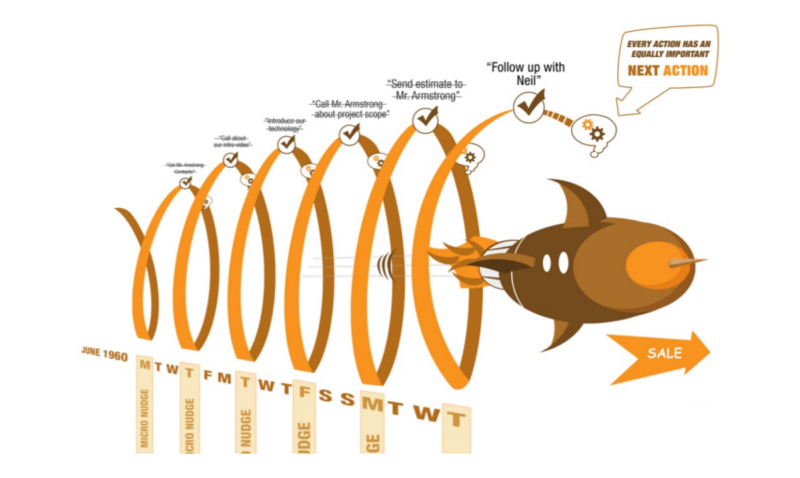 The sales loop is not complete until either a sale is made or the contact is put on hold (or deleted). Remember: For every Action, there is a corresponding future Next Action. Below is the locked loop in action. As well as dates for next actions, we also need to keep notes on our communications with people. Your notes should provide you with just enough detail to enable you to make the right move. 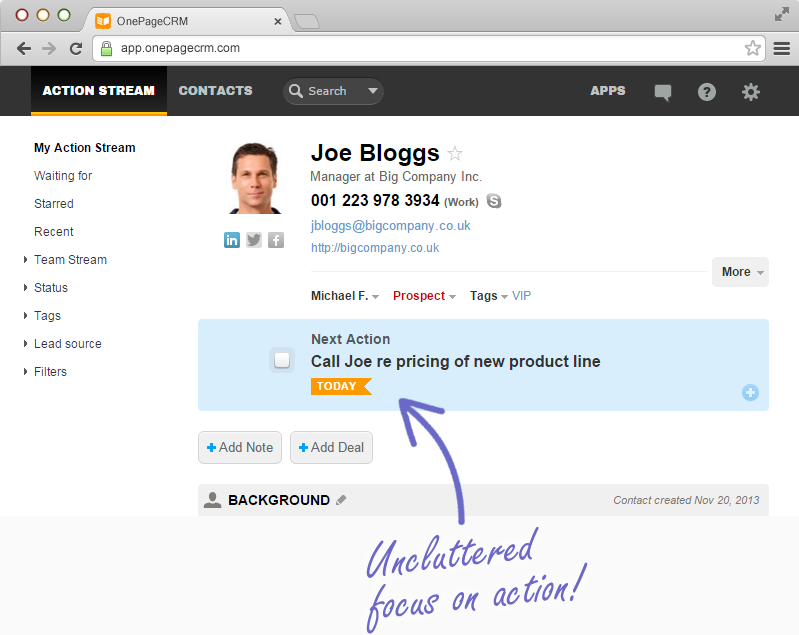 Notes should be linked to each customer and where necessary, each action. Notes might cover things like what the person said on each occasion they were contacted, what you replied and what tone the person used. Consider your Next Action as a ‘nudge’, a gentle push in the direction of finalising a deal with a prospective client. The days of the ‘car salesman’ approach to customer acquisition are thankfully, long since past. 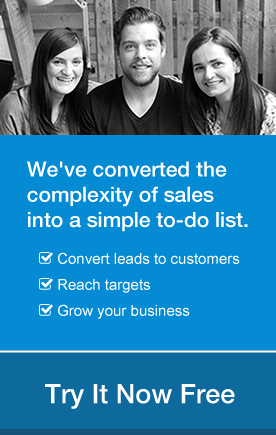 Building strong relationships with customers is the measure of modern sales success. A nudge gives the sense of moving things forward that is so important in sales but without being too pushy. A nudge could involve anything from being patient with a client while they make their decision, to helping them “sell” it to their colleagues/bosses. Always set a Next Action to follow-up, regardless of whether the time is now or later. So, there it is; our systematic approach to sales based on setting Next Actions, performing them in a timely and well-informed manner, moving the situation forward with a series of nudges, until hopefully agreeing a deal. 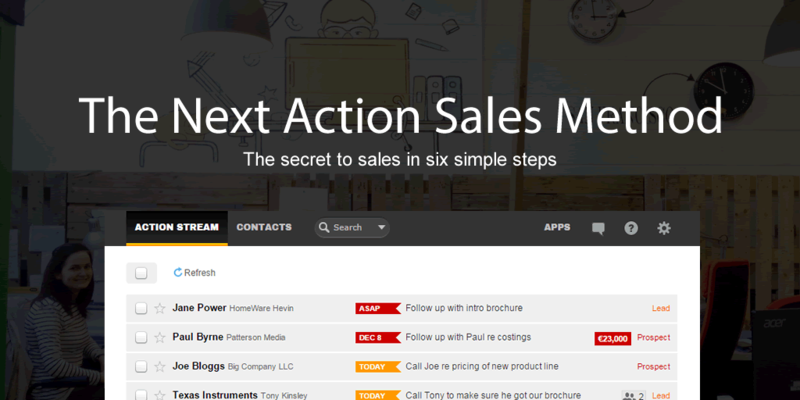 Keep administration to a minimum and selling at a maximum with the Next Action Sales method.